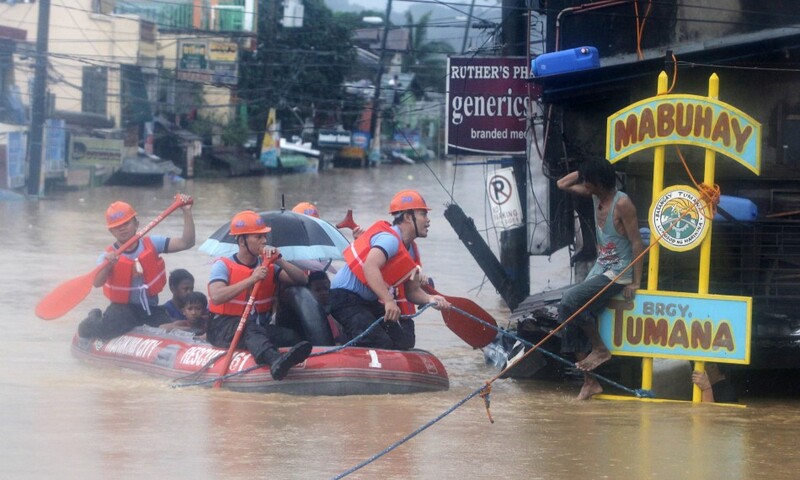 Flooding caused by some of the Philippines’ heaviest rains on record submerged more than half the capital Tuesday, turning roads into rivers and trapping tens of thousands of people in homes and shelters. The government suspended all work except rescues and disaster response for a second day. Officials reported at least seven people dead, 11 injured and four missing. The dead included a 5-year-old boy whose house was hit by a concrete wall that collapsed. His two adult relatives also were injured. Throughout the sprawling, low-lying capital region of 12 million people, floodwaters made most of the roads impassable and reached waist- or neck-deep along rivers and creeks. Authorities opened more than 200 evacuation centers in Manila and surrounding provinces filled with tens of thousands of people, Social Welfare Secretary Corazon Soliman said. Overall, more than 600,000 people have been affected by the floods. The flooding followed two nights of heavy monsoon rains, enhanced by Tropical Storm “Maring.” The storm hovered over the North Philippine Sea and drenched the main northern island of Luzon with up to 30 millimeters (just over an inch) of rain per hour. It was forecast to move away from the Philippines toward Taiwan on Wednesday. In many coastal towns along swollen Lake Laguna, near Manila, and in food-growing riverside provinces, residents were trapped on rooftops, waded through the streets or drifted on makeshift rafts. Many chose to stay close to their homes for fear they would be looted if they left. Floodwaters had subsided late Monday but the night of pounding rains Tuesday repeated the deluge. Authorities said that up to 60 percent of the capital region was submerged. Flooding has become more frequent in Manila because of deforestation of mountains, clogged waterways and canals where large squatter communities live, and poor urban planning. “We’re surprised by the rainfall. Some areas experienced record levels,” said Science Secretary Mario Montejo. According to an assessment from the Department of Science and Technology, rainfall reached 600 mm (23.62 inches) in and around Manila Bay on Sunday alone — more than a month’s worth of rain in a day. That’s compared to the disastrous 2009 Typhoon Ondoy, the strongest cyclone to hit Manila in modern history with 455 mm of rain in 24 hours. Many domestic and international flights at Ninoy Aquino International Airport were cancelled. Key roads leading to the airport are flooded and passengers and crew are inevitably delayed.